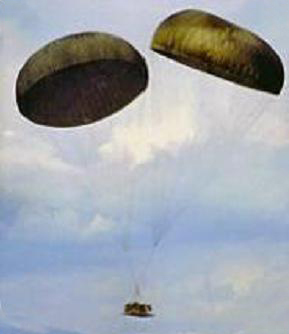 The G-11 100ft (30.3m) Cargo Parachute Assembly was developed primarily for platform airdrops and continues to be the only cargo parachute of this size which is readily available for military use. Note: The G-11C & G-11D assemblies are built to the G-11B Assembly specifications and are different because of rigging configurations. G-11A: Rigged with no centerline and uses two M-21 reefing line cutters with a 2-second delay. G-11B reefing: Rigged using 100-ft (30.5m) centerline to pull down canopy vent and four 16.5ft (5m) M-21 line cutters with 2-second delay. G-11C: Rigged using 100-ft (30.5m)centerline to pull down canopy vent and two 10ft (3m) M- 21reefing line cutters with 2-second delay. G-11D: Rigged with no centerline and uses four 12ft (3.7m) M-21 reefing line cutters with 2-second delay. The G-11 can be used singularly or in clusters of two or more, depending upon air delivery load weight, and can be dropped from minimum altitudes ranging from 700 ft AGL (213.36m) to 1300 ft AGL (396.24m). In its basic configuration, the G-11 is capable of supporting a 5000-lbs (2,267kg) pound payload and when in a cluster of eight, the assemble is capable of supporting up to 42,000-lbs (19,050kg). All material colors are U.S. Army Foliage Green #504.